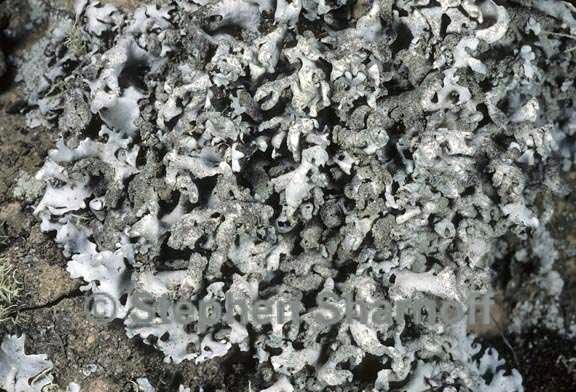 Thallus: foliose, 2-8 (-10) cm in diam., loosely adnate to adnate, irregularly lobate lobes: sublinear to subirregular, often short, plane to convex, usually separate, rarely slightly imbricate, 1-4 mm wide; axils: often sinuous; margin: entire, rarely somewhat incised; apices subtruncate to rounded, often revolute (especially when sorediate), convex to subascending, often black upper surface: gray to greenish gray, smooth, shiny, faintly white maculate or emaculate soredia: initially farinose, becoming granular, initially in subcapitate, subterminal soralia that become crateriform, excavated pustulae, with age becoming confluent and often eroded, white or greenish white; isidia and dactyls absent medulla: white or off-white with continuous algal layer lower surface: black, brownish towards apices; rhizines: sparse, black, sparsely dichotomous Apothecia: very rare, sessile to substipitate, 2-6 mm in diam. ; disc: brown asci: clavate, 8-spored ascospores: ellipsoid to broadly ellipsoid, 10-12 x 6-8 µm Pycnidia: not seen Spot tests: upper cortex K+ yellow, C-, KC-, P+ yellow, UV-; medulla K-, C+ red, KC+ red, P- Secondary metabolites: upper cortex with atranorin and chloroatranorin; medulla with gyrophoric acids (major), 4, 5-di-O-methylhiascic acid, 5-O-methylhiascic acid (both minor), lecanoric and umbilicaric acids (both trace or absent). Substrate and ecology: relatively rare, on acidic rock or bark in lower montane and upper montane forests World distribution: neotropical and pantemperate (at least in regions adjacent to the tropics) Sonoran distribution: Channel Islands of California and montane areas of SE Arizona. Notes: This widespread species exhibits considerable morphological plasticity that requires further evaluation.